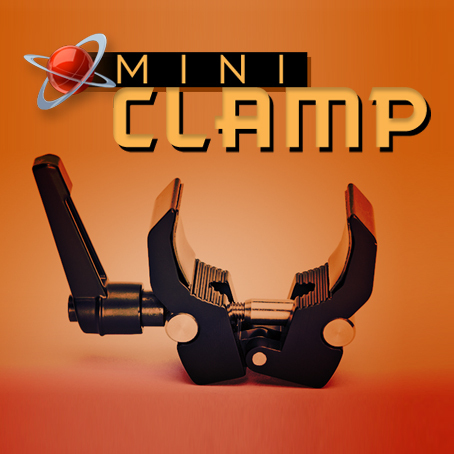 Weighing in at a mere 4.5 oz (128g), the Digital Juice Mini Clamp can support a load of up to 8.8 lbs (4kg), yet is light and compact enough to fit easily into your jacket pocket or camera bag. 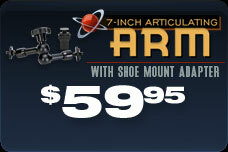 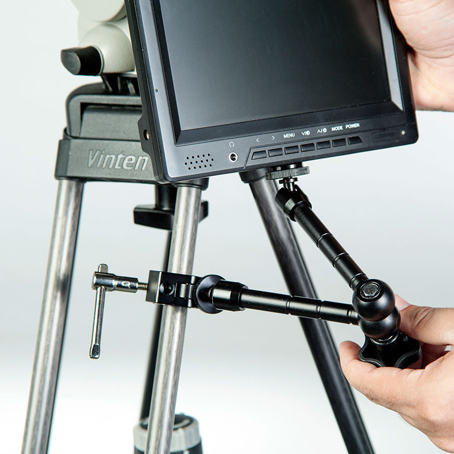 This versatile mounting device is a grip gear must-have because of its many uses and extreme portability. 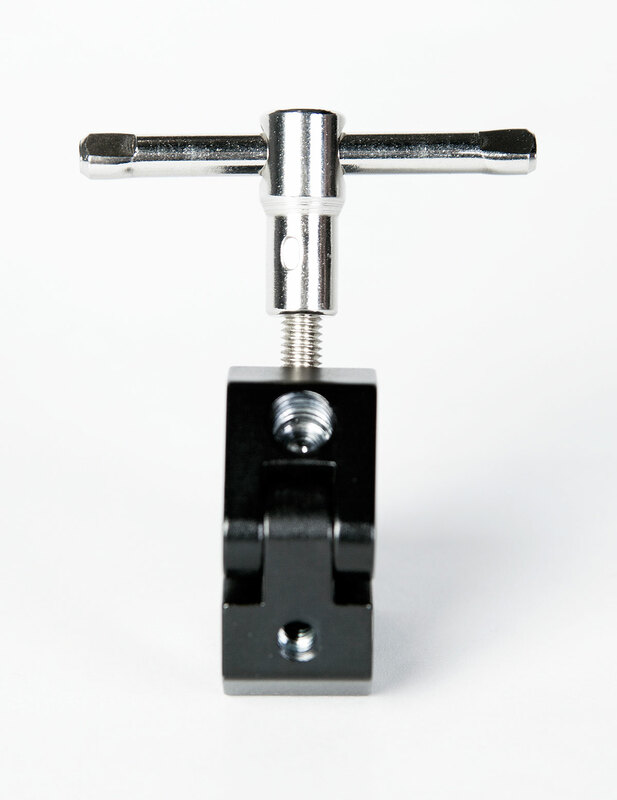 It comes with 1/4"-20 and 3/8" female sockets, making it ideal for use with virtually any lighting or camera accessory including articulating arms, LED lighting, small monitors, audio recorders, shotgun mics and more. 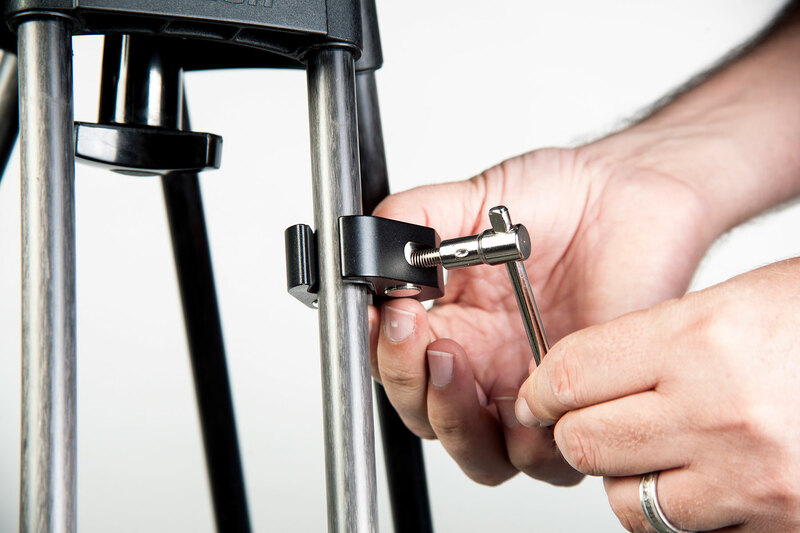 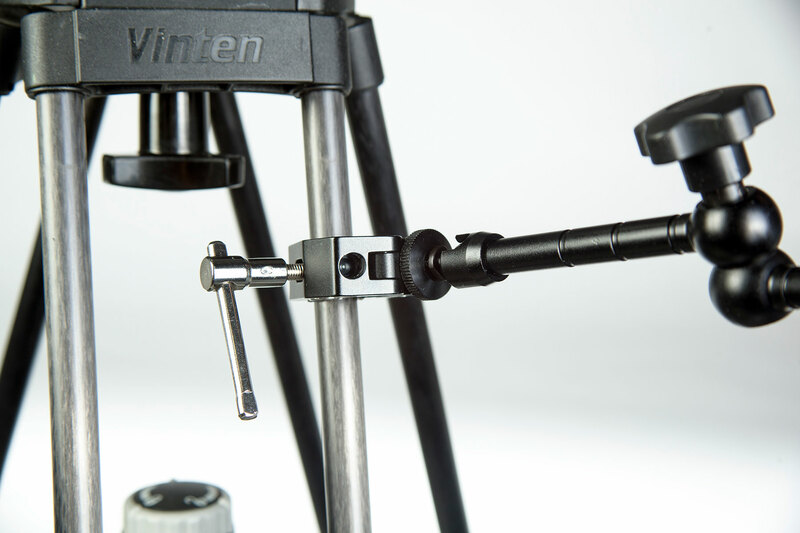 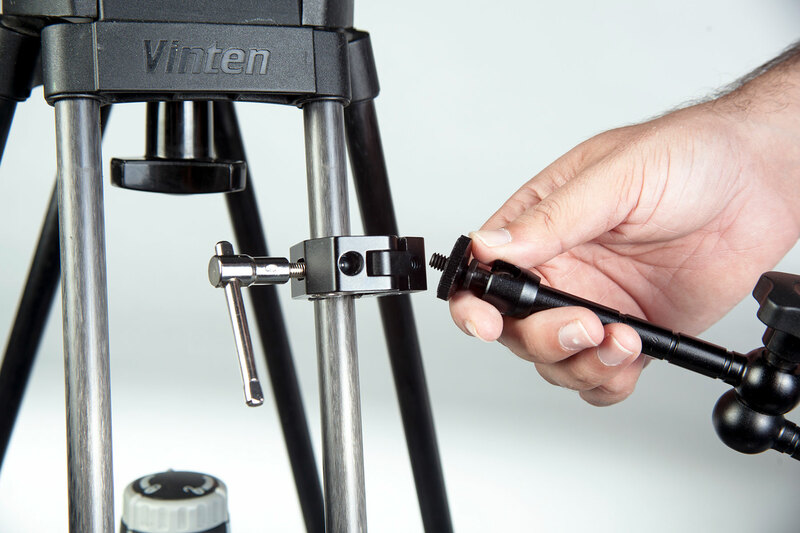 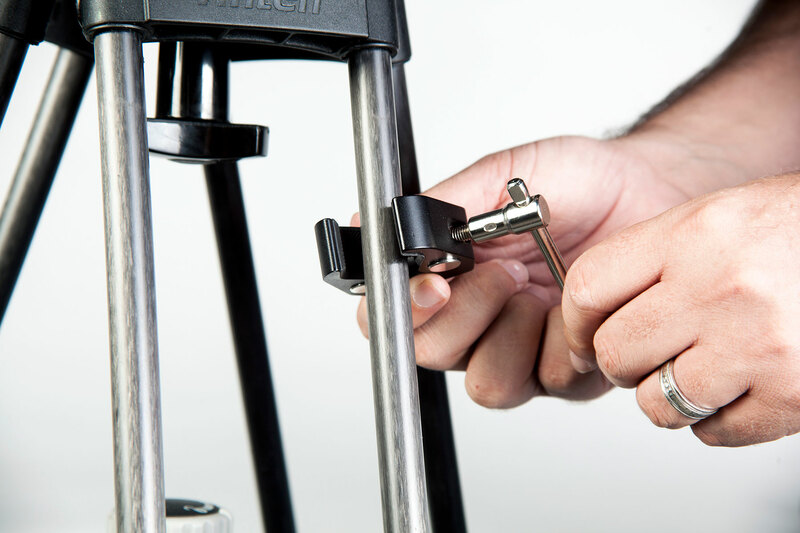 The Digital Juice Mini Clamp is designed to grip round, square or flat surfaces, holding on to everything from tripod legs, pipes & light stands to table or desk edges and tree branches when necessary. 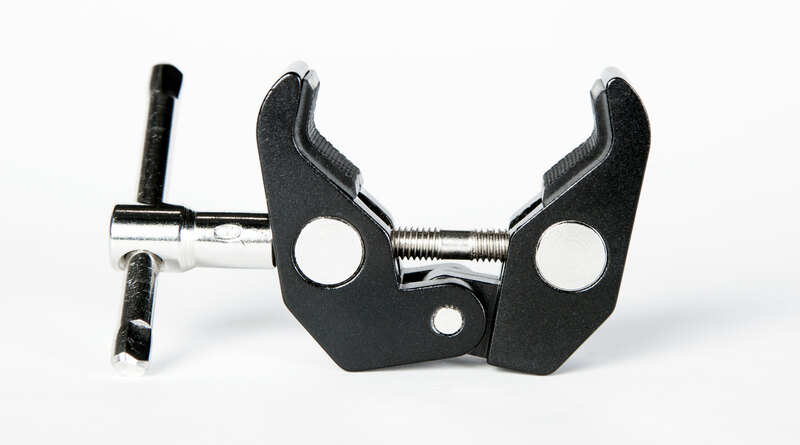 The textured pads which line the inside of the grip surface improve the grip and prevent damage to your gear. 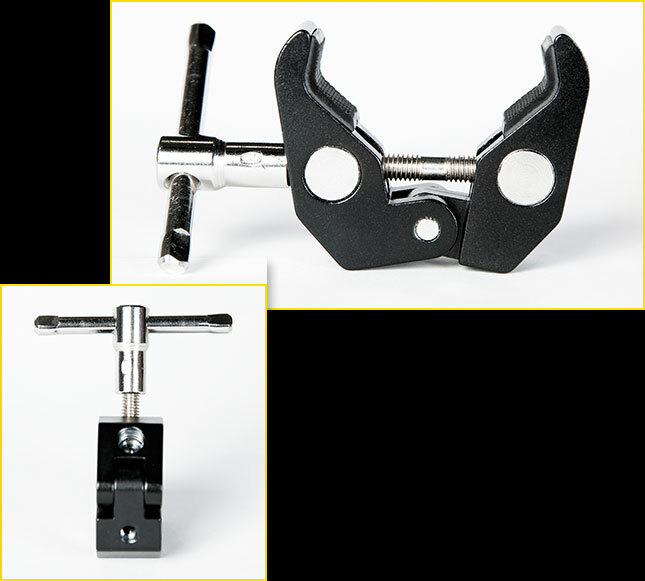 There are 1/4"-20 and 3/8" inch female sockets on the hinged end of the Mini Clamp, making it compatible with just about any piece of camera gear you may want to attach to it. 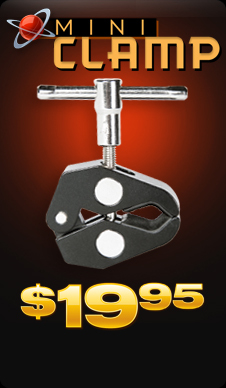 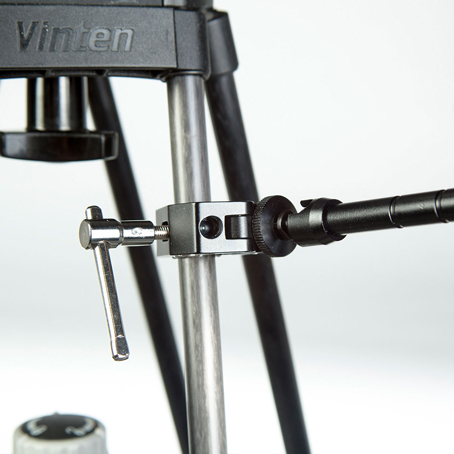 The Mini Clamp is lightweight, compact and easy to use. 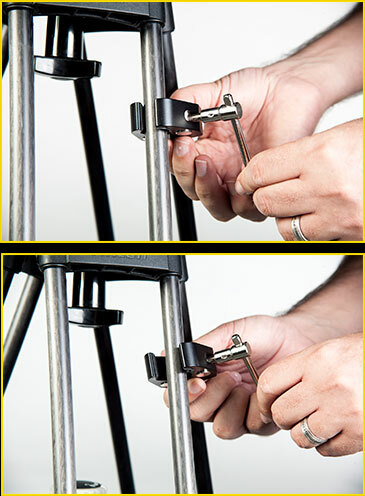 Just loosen the jaws of the clamp by turning the handle, place the open jaws around the tripod leg, and then tighten the grip once more by turning the handle in the opposite direction. 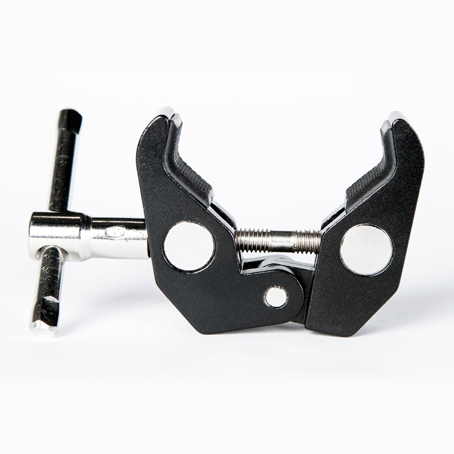 The long slide-through aluminum handle is designed to give you enough leverage to make it easier to tighten and loosen the clamp from any position. 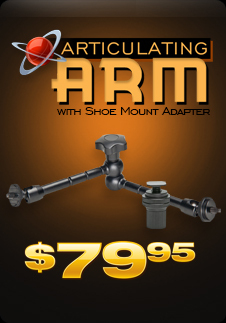 The Digital Juice Articulating Arm and Mini Clamp are perfect portable companion products. 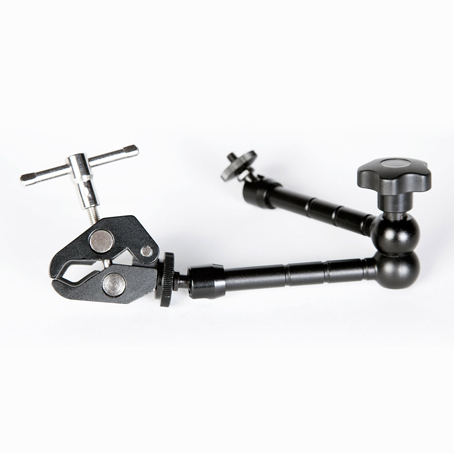 Each increases the functionality of the other to give you more options when shooting in the studio or on the go. 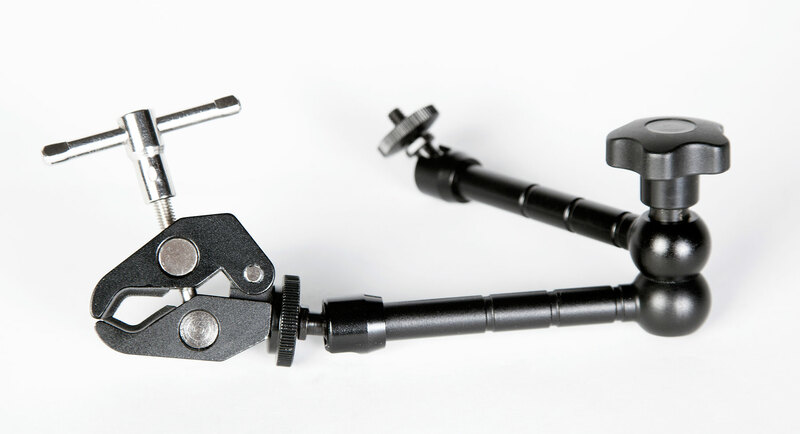 To attach the Articulating Arm to the Mini Clamp,just attach one of the 1/4"-20 screw ends of the arm to the corresponding hole on the Mini Clamp and tighten the connection by turning the screw knob on the arm joint. 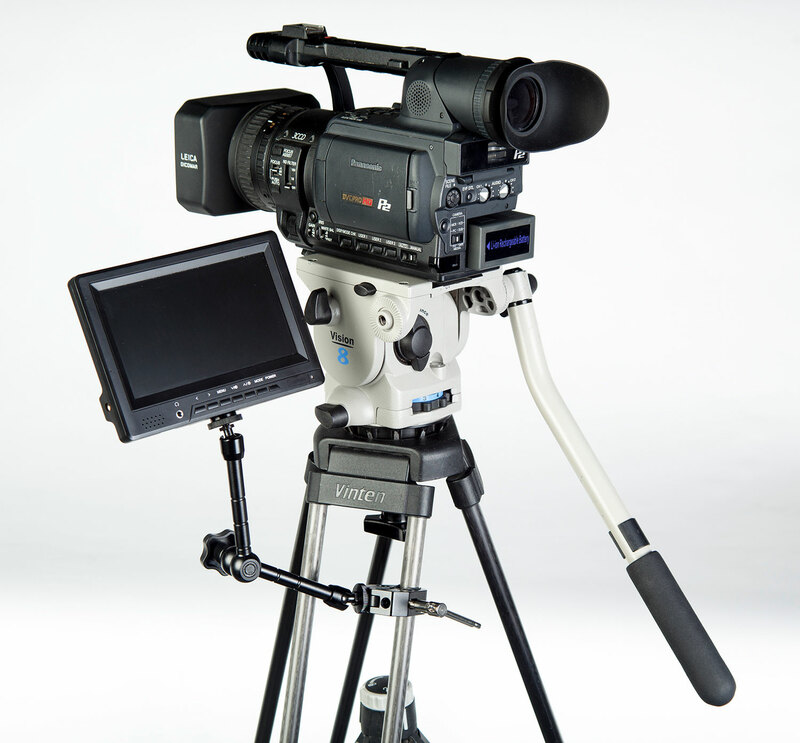 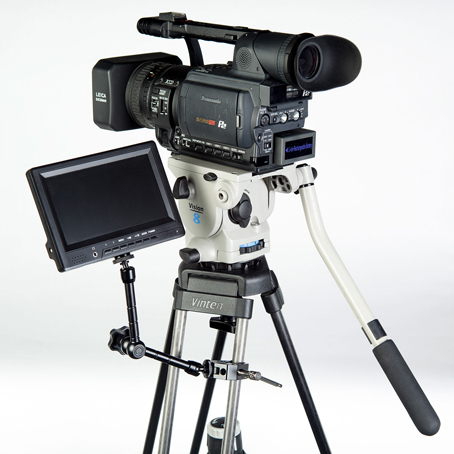 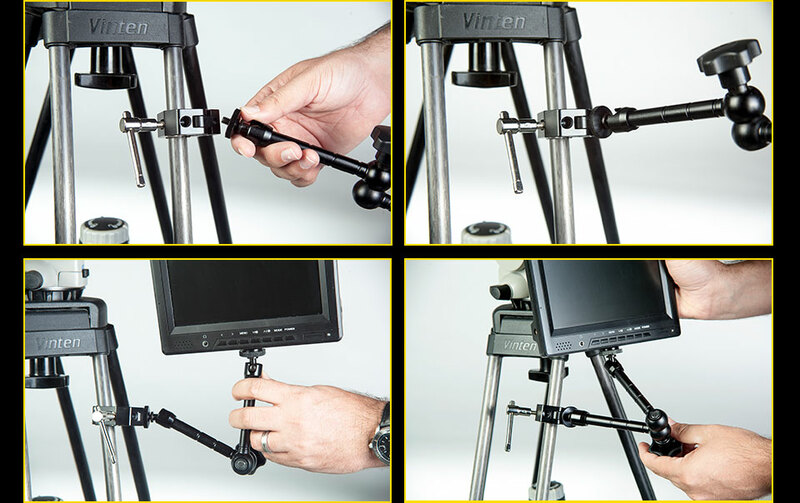 Once attached to the tripod leg, the Mini Clamp-Articulating Arm combo can be used to add a monitor for easier viewing of the action or an extra LED light in a small space. 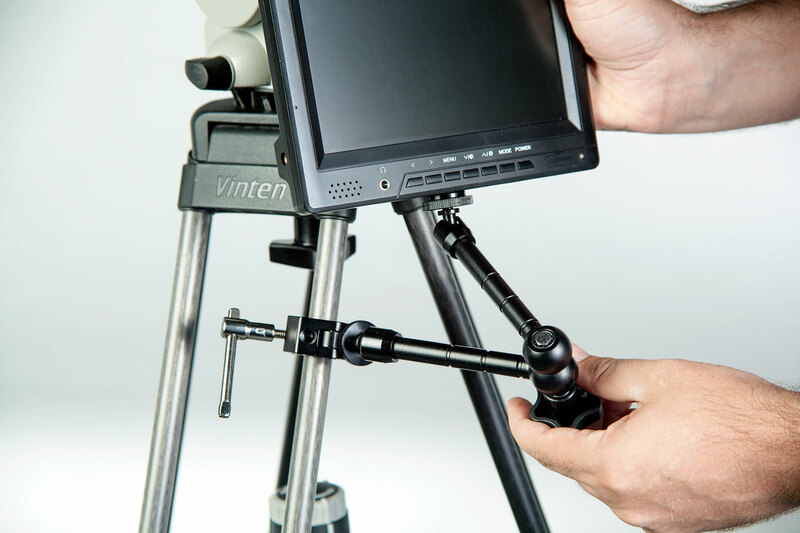 Whether shooting indoors or outdoors, having a monitor attached to your tripod makes seeing what you are shooting, and framing it properly, dramatically easier. 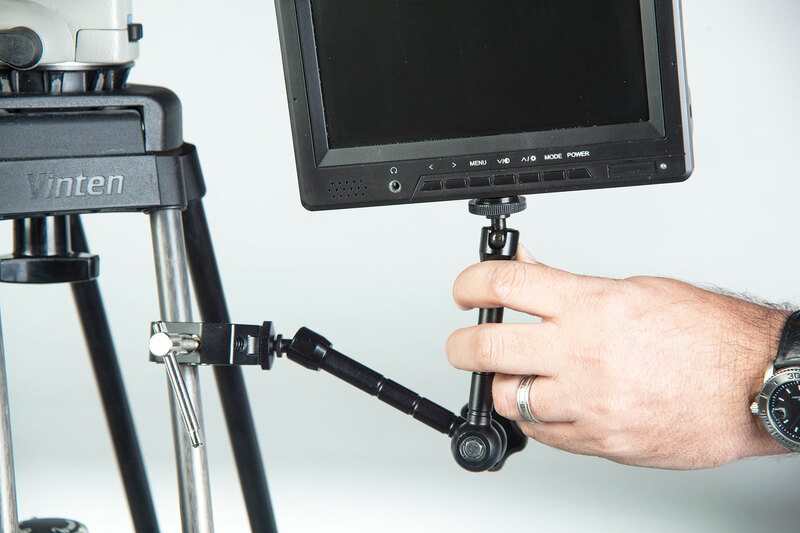 You can angle the monitor on the Articulating Arm so that the view is perfect for your position, without getting in the way of your shot.